Forced air makes for all the difference. and a 2-3ft tall flame. Not seen: the hose to put of any stray flames. Instead of making posts here, I’ve been doing things. Over a two and a half years ago, I first attempted to melt aluminum in a tin can. Well, since then, I’ve managed to make a bit of progress on melting aluminum. The biggest issue I had with my first attempt was a lack of forced air. I tried using a stand fan then, and there was not enough air, and it wasn’t directed at the charcoal. My first successful attempt used a leaf blower on the lowest setting to get sufficient air, and charcoal as fuel. An attempt or two later, I was able to use dry wood as a fuel source. This is nice, because I have plenty of wood about to use as fuel at no cost. After building a standard fire to get a decent size bed of coals, I turn on the leaf blower to kick up the heat and then start piling on wood as long as it doesn’t produce a lot of smoke. Eventually, it builds up to what is show in the image. 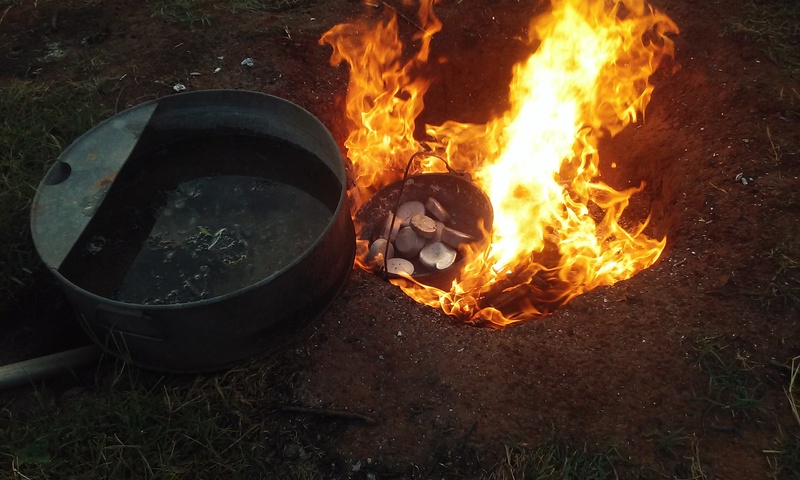 At this point, wood gets added to the outside edge of the fire and after it gets blackened and the wood under the crucible (in this case, the smallest dutch oven I had) is gone, the charred wood is moved under the crucible. Several times, I’ve melted aluminum cans and formed ingots by pouring the molten metal into a steel muffin tin. 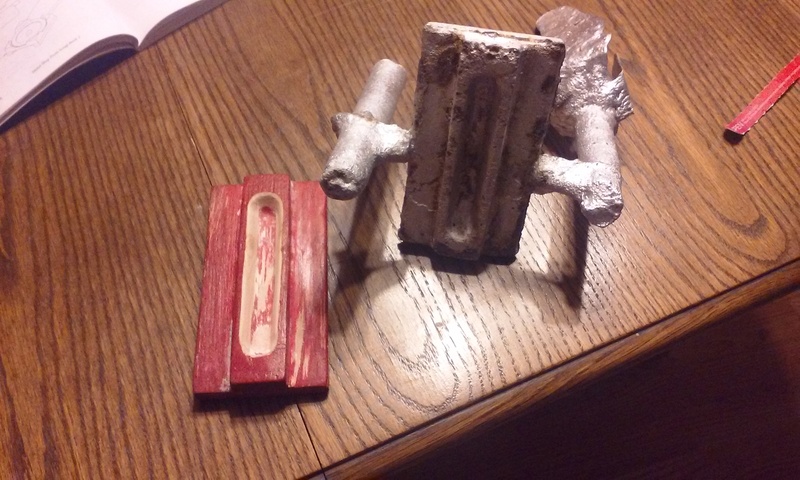 Today, however, was the first time that I cast a metal part, the carriage assembly for a Gingery lathe. The part didn’t turn out perfect: there are several defects on the top face where the steel way for the cross slide attaches. I will be attempting this casting at least once more and take the best of the castings to actually use. I have the pattern for the cross slide nearly ready as well, but I will need to obtain a short piece of 1/2″ steel round shaft for the center hole. Otherwise, that would likely be my next casting.